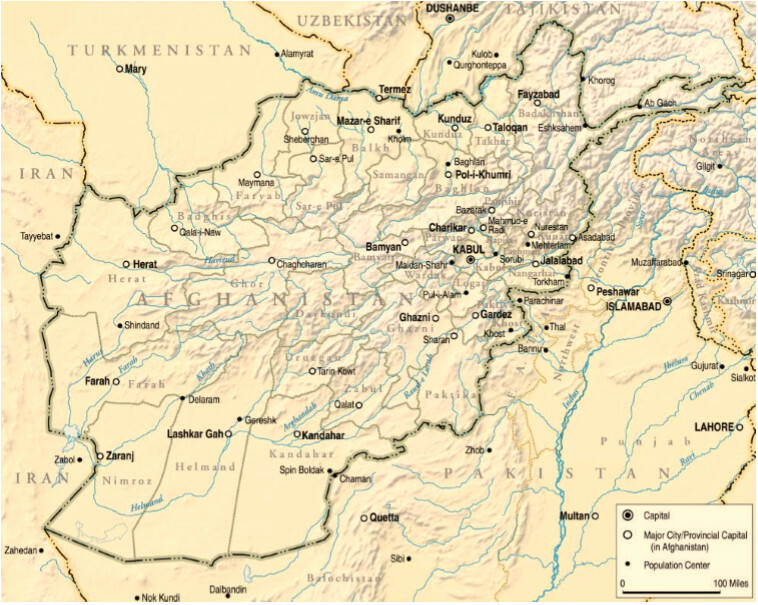 Afghanistan has seen a new escalation of violence and non-government armed groups (NGAGs) such as the Taliban and Islamic State Khorasan (ISK) control more territory now than they have since 2001.? Active conflict is disrupting civilian life, limiting access to basic services and raising protection concerns for 17m Afghans in 106 districts.? The volatile, unpredictable security situation and a severe drought in 22 of 34 provinces has led to the displacement of 585,000 people in 2018 with urgent shelter, food, protection and WASH needs.? The drought has exacerbated food insecurity, decreased livelihood opportunities and increased WASH and health needs, particularly in rural areas.? An increasing number of returnee-IDPs from Iran put additional pressure on host community resources and international assistance.? Afghanistan is also prone to sudden-onset disasters including avalanches, landslides and flash floods. Anticipated above-average precipitation due to El Niño could lead to devastating outcomes due to current drought conditions.? 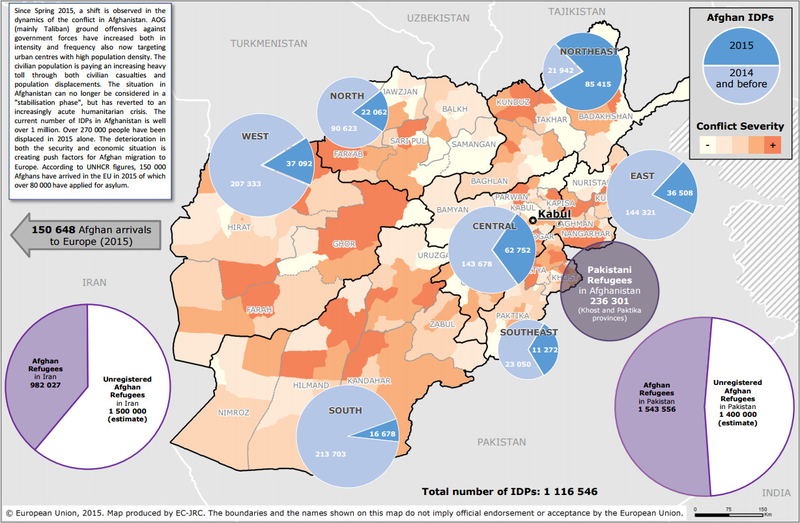 Read our Briefing Note on floods in south and west Afghanistan in March 2019. INFORM measures Afghanistan’s risk of humanitarian crisis and disaster to be very high, at 7.8/10, putting it at rank 4 on the global crisis level. Afghanistan rates 8.8/10 for hazard and exposure and 7.5/10 for a lack of coping capacity.? Insecurity and the presence of NSAG hamper the delivery of humanitarian assistance across the country. At least 46 districts are classified as hard-to-reach areas, where needs for multi-cluster interventions are estimated to be high but only limited data is available.? Access to areas controlled or contested by NSAG is especially constricted, as NSAG demand illegal taxation and humanitarian workers report pressure from government officials not to respond to these areas.? Decades of conflict have left major supply roads in very poor condition and are often targeted by NSAGs. Land mine contamination and targeting of humanitarian aid workers further add to access constraints.? 16/04: Heavy rain and flash floods continue to affect parts of West, East and North Afghanistan. On 15 April, flash floods affected Kohsan, Oba, Karrokh, Shinidand and Guzara districts in Herat province, killing at least 5 people. The number of people affected and impact on houses, agricultural land and other infrastructure remains unclear. At least 22 of 34 provinces are at risk of flash floods over the coming days. Since the beginning of the year, more than 220,000 people have been affected by floods and some 20,000 houses have been damaged or destroyed.? 10/04: Heavy floods continue to affect western and northern Afghanistan, affecting close to 58,000 people across 8 provinces. On 6 April, seven people died in flash floods in Dar-e Sof Paen district of Samangan province. On 8 April, up to 5,000 individuals were displaced from Qoshtapa district of Jowzjan province due to floods. Needs likely include emergency shelter, food, NFI and WASH assistance. ? 04/04: In the first three months of 2019, 100,000 Afghans returned from Iran (95,000) and Pakistan (5,000). Only a fraction (5-10%) of returnees from Iran receive assistance and there is a lack of information on conditions of returnee-IDPs in Afghanistan.? 04/04: Floods in Herat, Badghis, Faryab, Sari Pul, Jowzjan and Balkh provinces in western and northern Afghanistan since 27 March have affected 17,000 people. Widespread damages to housing, agricultural land and infrastructure is reported, compounding already high levels of food insecurity in affected provinces. Emergency needs include shelter, food, NFIs and WASH.? See ACAPS Special Report for more information. 04/04: On 23 March, armed clashes between ISKP and the Taliban in Chapadara district of Kunar province intensified. This has resulted in the displacement of 21,000 people within Kunar and Nangarhar provinces. More than 15,000 people are in need of NFI, food, nutrition and WASH assistance. 7,000 students are deprived of access to education.? February: Above-normal snow- and rainfall anticipated for late February attributable to likely weak El Niño event could support recovery from a severe drought in 2018. Risk of crop damage due to floods, landslides and pests because of higher humidity could intensify food insecurity.? 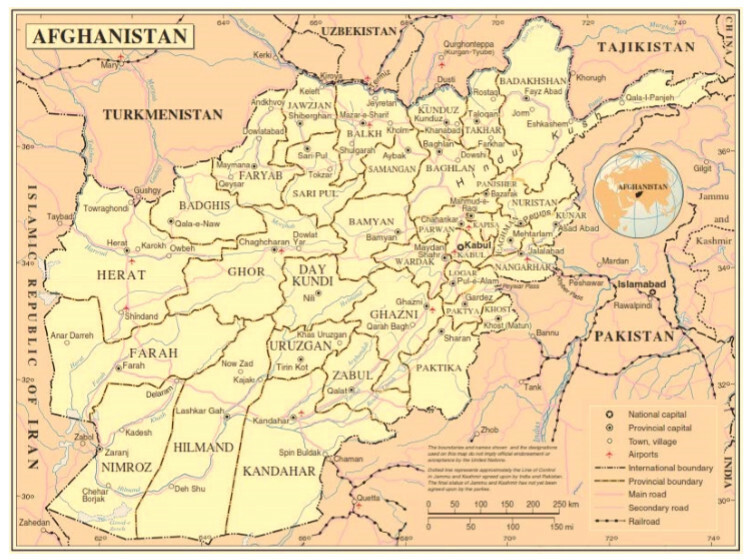 February to May: Large parts of Daykundi and Badghis as well as several districts of Badakshan are expected to face IPC 4 level outcomes between February and May.? July: Presidential elections are scheduled for 20 July 2019.? Protection: The indiscriminate use of IEDs, ground engagements and aerial operations are largely responsible for an average of 10,000 civilian casualties per year (2014-2018). Pre-existing gender and social inequalities have been exacerbated by the crisis. 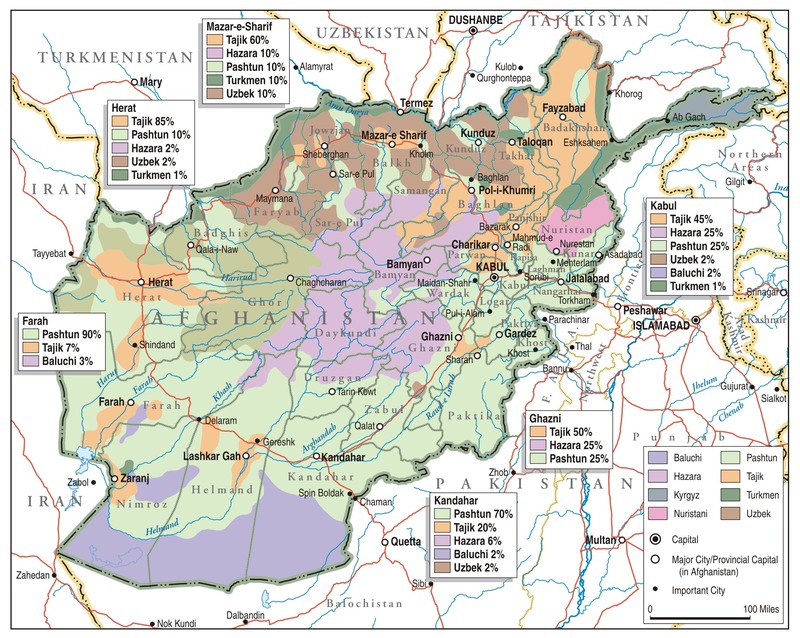 WASH: Close to 60% of Afghanistan’s population does not have access to improved sanitation and 36% rely on unimproved water sources; the drought has increased the use of unsafe water sources. Access is often restricted due to ongoing hostilities, mine contamination, NSAG presence and remoteness, which subsequently decreases the accuracy of assessments of humanitarian needs. Considering high population mobility and access restrictions, it is often difficult to track movements of internally displaced and returning populations. Months of higher temperatures, usually from April to October/November, represent the Afghan fighting season, because milder temperatures make roads and other infrastructure, as well as mountain passes, more accessible.? Heavy rains, usually falling from January - April, often cause flash floods and landslides in remote, northern areas of Afghanistan. ?